According to the 2018 Revision of the ‘World Urbanization Prospects’, 70% of the world’s population will live in cities in 2050. With his ‘IntenCity’ manifesto, architect and urban planner Jean Paul Viguier, stimulates the current debate about the working methods of urban design: How can an increasing population and the resulting density and intensity be conducted responsibly by city planners and architects? Jean Paul Viguier and Martha Thorne will discuss recent challenges and resourceful proposals to provoke a rethinking of today’s urban agglomeration development policies. Jean-Paul Viguier & Associés is an internationally operating practice founded in 1992 and based in Paris. The practice designs and develops projects following a global approach that spans architecture, urban planning, landscaping and interior design. In this exhibition Jean-Paul Viguier presents his manifesto on ‘IntenCity’: How can a growing population and the resulting density and intensity be conducted responsibly by city planners and architects? The ‘IntenCity’ manifesto will be illustrated using four key frames of reference: ‘Historical-Urban Intensity’, ‘Architectural Intensity’, ‘Landscape Intensity’ and ‘Demographic Intensity’. It will be demonstrated and elucidated through four selected projects on display in the playful installation: the Espace Claude Monet in Rouen (2012), the Confluence Leisure and Shopping Center in Lyon (2012), the MUSE District in Metz (2018) and the NEO-Europea District in Brussels (2025). Viguier's key challenge is how to deal with the increasing population as well as the resulting density and intensity responsibly, once the Department of Urban Planning and Design at Harvard University forecast for the year 2050 has become reality and 70% of the world’s population lives in cities. The exhibition installation begins with the manifesto written by Jean-Paul Viguier presenting the concept of “IntenCity” as well as the main principles governing the work of the practice. Etymologically, depending on the context in which it is used, the term “intensity” refers to notions of measurement and quantity as well as strength and power. The notion of “intensity” becomes the scale that is applied to architecture and refers to its context with specific historical, geographical, urban or program-related features. Viguier states: ‘The IntenCity concept can be applied on different scales, from a multi-functional building to an urban district with the full array of central functions of a town, or to a “fragment” of a town. It comprises the regenerative capacity of an entire area of a city on the basis of the same principles: economy of land space, project multifunctionality and resulting agglomerated urban form in a landscape project, with simultaneous construction of all elements of the project’. 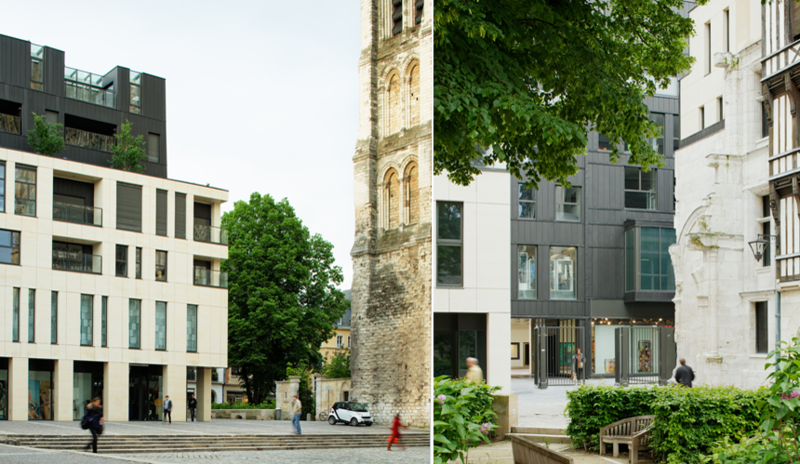 This mixed-use development is a modern piece of architecture in close proximity to the UNESCO World Heritage site of Rouen Cathedral. The new building includes urban apartments, shops, a gallery, offices and a belvedere that is open to the public. The project has been widely acclaimed for its contextual architectural approach using local stone for the main architectural volume. The thickness of walls is crowned by a two-level space in black zinc that allows the public a view of the Cathedral and the city. The site was a former industrial site in the district of Confluence, where the Saône flows into the Rhône. The newly created gigantic roof spans the mixed-use project, which comprises a car park, shops, a cinema, restaurants and a hotel. The main railway line passes through the building as a way to integrate urban constraints into urban design and thus to include train movement in the scenery of the city. The resulting hub demonstrates its capacity to act as an urban generator as well as an iconic piece of architecture, giving this area an identity related to Lyon. MUSE is the beating heart of the new district around the Centre Pompidou Metz: a project that presents a mix of functions where housing meets businesses, shops, leisure and art. The design comprises of a group of urban blocks with various functions; on the street commercial facades are alternate with entrances to apartment blocks. Above the shops is a carefully landscaped garden, which is visible from the ground and used by apartment tenants as a terrace. The proximity of the Centre Pompidou Metz encourages the presence of art within MUSE, for example with Julio Le Parc’s monumental piece hanging above the entrance rotunda. NEO-Europea is an urban re-invention: a landscaped district as well as a residential space and tourist destination comprising housing, leisure shopping, education, art and sports around the iconic Brussels Atomium. The building height is moderated, altough an 80-metre tall residential tower on the edge of the site allows a view over buildings and sports fields. All materials have been harmonized, so that they remain gently shaded. The landscape design has been developed by the landscape architect Kathryn Gustafson (Gustafson Porter+Bowman’s, London) and consists of large public spaces as well as a series of water features, offering rest areas, promenades and playgrounds for children. Jean-Paul Viguier & Associés is an internationally acclaimed architecture and urban planning company, founded in 1992 and based in Paris. Fostering inter-generational relations, the practice employs 160 people from 17 countries led by Jean-Paul Viguier and 12 partners. His iconic works have gained international recognition, including for: the French pavilion at the Seville World Fair (1992), the France Télévisions headquarters (1998) and the Parc André-Citroën (2000) in Paris; the Coeur-Défense twin towers (2001); the Sofitel Magnificent Mile in Chicago (2002); the McNay Museum of Modern Art in San Antonio; TX (2008) – the first ever American modern art museum built by a French architect; the Maroc Telecom tower in Rabat (2012; the SFR campus in Saint-Denis (2013); the Majunga Tower in La Défense (2014); the Oncopole and the Institut Universitaire du Cancer in Toulouse (2014) and many more. Recent and forthcoming works include: Jo&Joe (2019), the first wooden open house in France; Hypérion, one of the tallest residential towers constructed in wood (57 metres) in Bordeaux (2020); the Europea quarter in Brussels (2025) – the remodeled site of the 1958 World Fair around the Atomium; the Vinci headquarters in Nanterre (2021) and the Orange headquarters in Issy-les-Moulineaux (2020); the fiduciary hub of Banque de France in La Courneuve (2018); an office tower in Casablanca (2022), and the IoT Valley in Toulouse (2020). Placing the architect in constant contextual movement, many of the works of Jean-Paul Viguier et Associés form part of a reflection on the connection between heritage and contemporary architecture, such as: the archeological museum of Pont du Gard (2000); the Natural History Museum in Toulouse (2008) and more recently in Paris the Canadian Embassy and Cultural Center (2018) as well as the architectural remodeling of Chanel (2019). Jean-Paul Viguier was awarded the Cities Monitor grand prize for Parc André-Citroën, received a mention for the Prix de l’équerre d’Argent of Architecture for his industrial hotel activity building at Rue d’Aubervilliers in the 19th district of Paris, and won the Architectural Record-Business Week Award in New York for the Astra Pharmaceutical Headquarters in Rueil-Malmaison. The Sofitel Chicago Water Tower received “the decade´s best building award” in 2003 from the AIA Chicago; this building is listed " by the American Institute of Architects as one of the "150 favorite buildings of America” and received the MIPIM Award in 2005. Pont du Gard holds the designation ‘Grand site de France’. Viguier was elected as a member of the Academy of Architecture in 1993, and held the office of president from 1999 to 2002. He is also a founding member of AFEX (French Architects for export). He was appointed ‘Honorary Fellow’ of the AIA (American Institute of Architects) in 2001 and Honorary Professor of Tongji University in Shanghai, China.